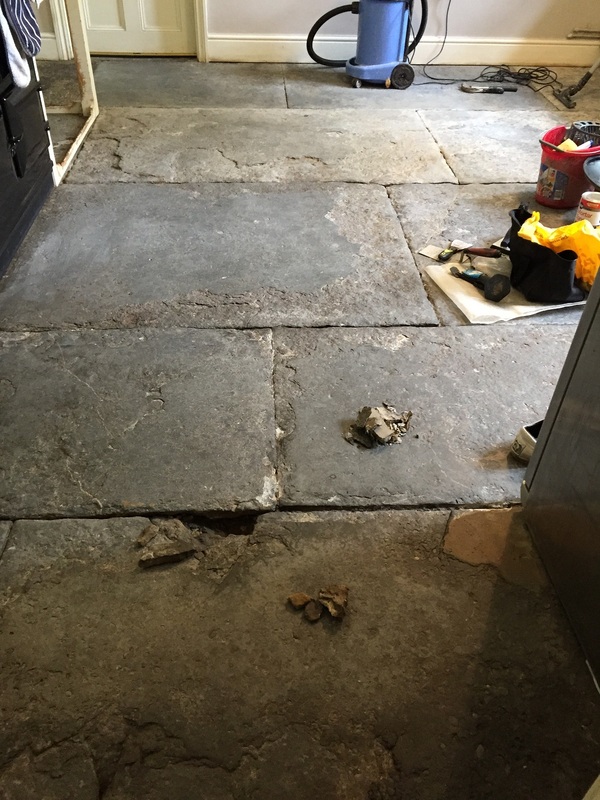 This post comes from the kitchen of a house in the village of Odcombe, which is a few miles west of Yeovil, where the Blue Lias Flagstone floor which dated back to 1780 was far from looking its best. 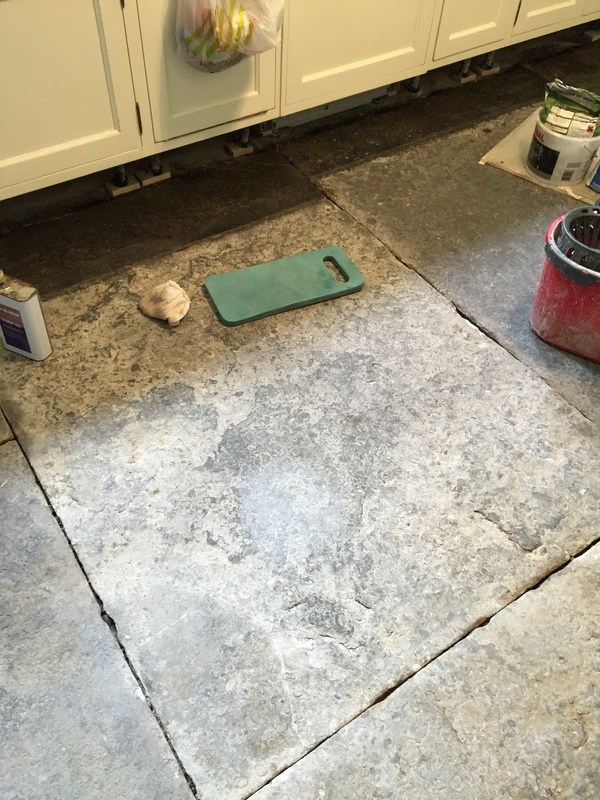 With the exception of ingrained dirt the Flagstones were in good physical condition considering their age but the some of the grouting had come loose and would need replacing as part of the restoration process. If left unprotected dirt becomes ingrained into the pores of stone and once this happens it can become very difficult to keep it clean. A sealer will add that layer of protection but does wear off over time and in this case I suspect it had been quite some time since the floor had been given a deep clean and re-seal. To deep clean the floor we spent two days scrubbing the floor with Tile Doctor Pro-Clean which is a multi-purpose cleaner/sealer remover that’s designed for use on Tile, Stone and Grout. The product is diluted with water and then applied to the floor where it is left to soak into the stone for ten to twenty minutes before scrubbing the floor with a rotary machine fitted with a scrubbing pad. This process released the dirt from within the pores of the stone and we were able to rinse it away with more water which was extracted using a wet vacuum. The process was repeated a couple of times to ensure the stone was as clean as it could be and we used stiff brushes along the grout lines where the pad struggled to reach to ensure the grout was also clean. One done our attention turned to raking out loose grout and replacing it with new in a matching colour to ensure it blended in with the old. We left the floor to dry for a further two days before returning to apply a sealer, it’s important that the floor is dry before sealing as applying a sealer to a damp floor will can have undesirable results. 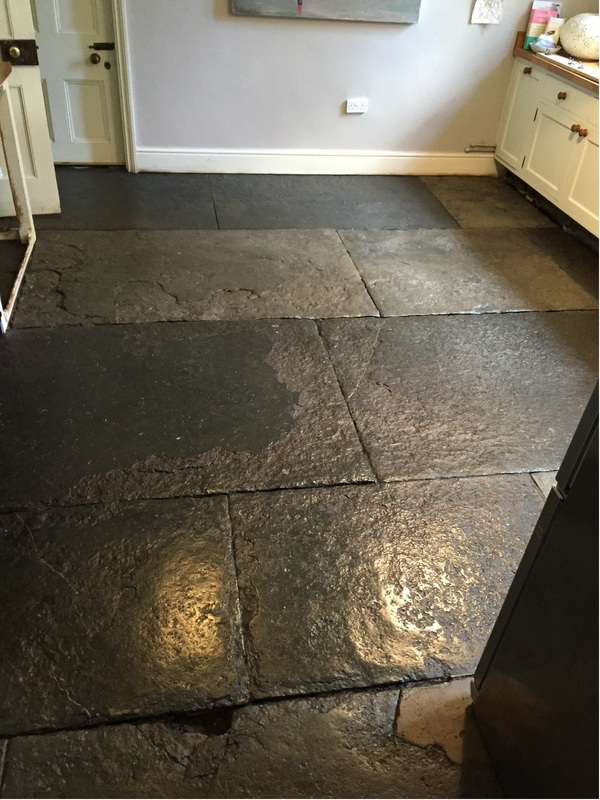 After the deep cleaning process, the Flagstones were looking cleaning but rather grey so before sealing and to bring the colour back two coats of Stone oil were applied and left to soak in. 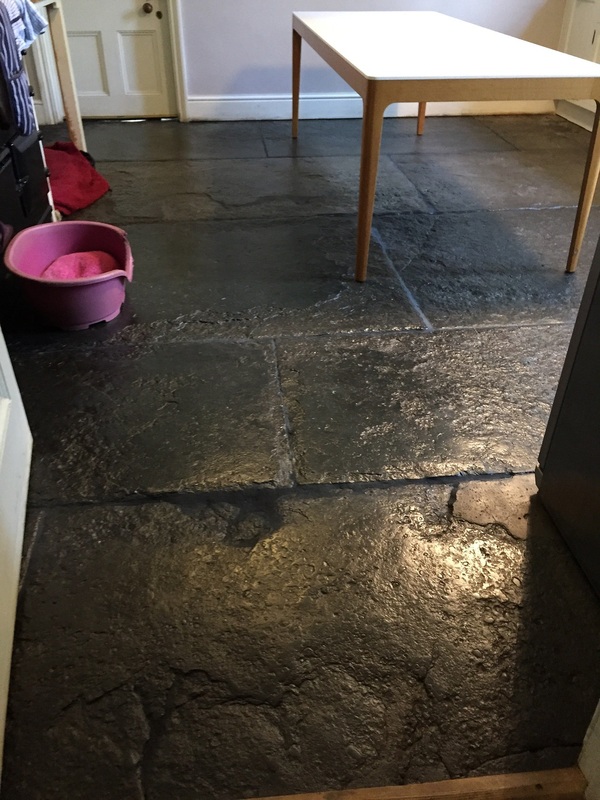 Once the Stone Oil had dried it was followed by sealing the floor with Tile Doctor Seal and Go which is a water based sealer (so no smell as it dries) that leaves an appealing satin sheen lifting the appearance as well as protecting the stone. It took some time to do but I think you will agree this two-hundred-year-old floor has been transformed by the process.